What is Blackboard Learn Ultra? Blackboard Learn Ultra is the Learning Management System (LMS) used at ECU for short courses. Blackboard Learn Ultra is not a replacement for the Blackboard Learn 9.1 LMS, as used for undergraduate and graduate coursework. 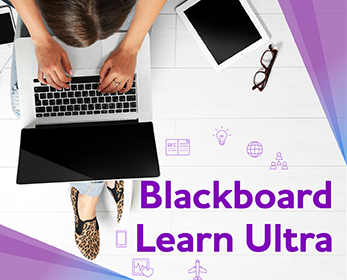 Blackboard Learn Ultra provides a personalised learner experience with intuitive navigation, streamlined workflows with mobile-friendly device support. Planning. Instructors can leverage and reuse course materials while planning their courses, in order to streamline their workflow and minimize minutia. This content is displayed in a familiar outline structure. Driving student success. Instructors can better coordinate and support student success through integrated, simplified quantitative understanding of learning progress. Grading. Instructors can experience extraordinarily streamlined grading, so students can view and understand assessment in time for it to resonate. Filtered, personalised deadline tracking. The stream presents students with a prioritised list of what they need to do, and filters out the noise to provide a deep sense of signal. Students can see exactly what’s due, and can respond to the most pressing academic deadlines. Supportive encouragement. Students view integrated analytics in their stream in a helpful, colloquial voice. These analytics help students gain an awareness of their activity and take action in an appropriate timeframe. Centralised course outline. Students can view their courses in both a timeline and a visual course calendar, helping them understand and manage their progress. An integrated course list sets the scene for future-looking degree and academic planning. Seamless transition between mobile and desktop. Students can build and maintain awareness of their academic journey in any digital modality, and move easily between Blackboard Student and Blackboard Learn with the Ultra experience. Are we moving all ECU units to Blackboard Learn Ultra? No, Blackboard Learn Ultra is only for short courses. Should I use Blackboard Learn 9.1 or Blackboard Learn Ultra? For all ECU offerings (undergraduate and postgraduate) we continue to use Blackboard Learn 9.1. Blackboard Learn Ultra is only for non-award ECU short courses. Who do I speak to/how do I get my short course onto Blackboard Learn Ultra? Where do my students get support for Blackboard Learn Ultra? Students having problems within their courses, please contact the appropriate School. Where should I and my staff get training? Access the Staff Development Calendar to view the upcoming training sessions and Nominate your attendance. How do I login to Blackboard Learn Ultra?